where λq is the fraction on critical damping and ω is the angular frequency. The variation of the damping ratio with the angular frequency αq is show in previous picture. There are three curves: mass-components; stiffness components; and the sum of both components. 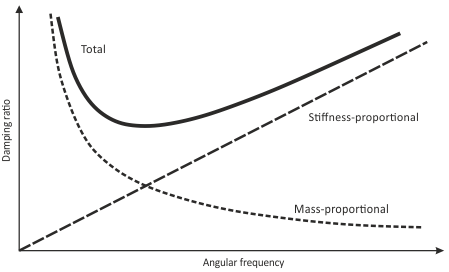 The mass-proportional damping is dominant at lower angular-frequency ranges, while stiffness-proportional damping dominates at higher angular frequencies. The stiffness-proportional damping is linearly proportional to response frequency and the mass proportional damping is inversely proportional to response frequency. where θ1 is the first mode shape. The fundamental Frequency of the model is calculated at the first iteration. 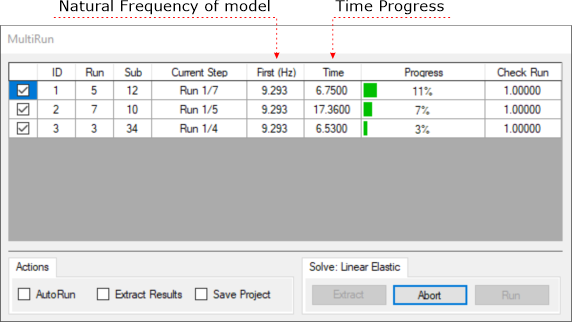 The Visual-Q4M automatically calculates the natural frequency of the model. The Visual-Q4M is an independent Pre & Post Processor for numerical simulations with Quad4M. The Quad4M was mentioned for research purposes only and all information in this regard can be found at this link that it hasn't got no link type or relationship with Visual-Q4M. The Quad4M can be download from this link to use in personal research and study.